Do you have a class blog using Blogger, WordPress, Weebly, Tumblr or Joomla? If you do, SpeakPipe is a cool way to connect with your readers. 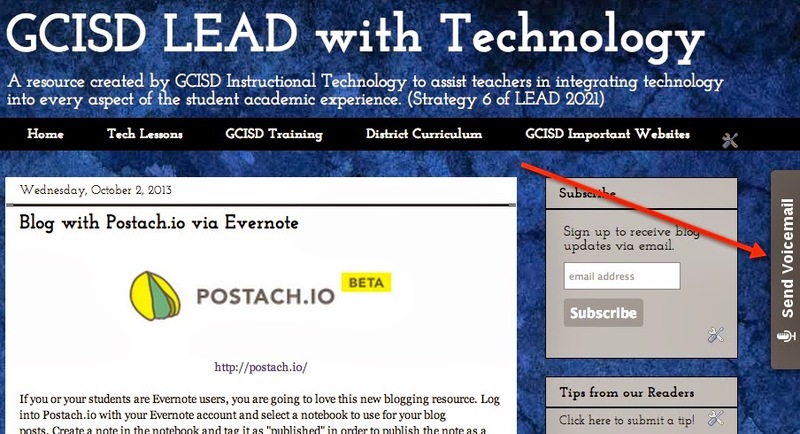 SpeakPipe add a "Send Voicemail" tab to the side of your blog that readers can click to record a voice message to your class. The free plan allows you to receive up to 20 voice messages a month (90 seconds max per message). To get started, just go to https://www.speakpipe.com and create a free account. Choose your blogging platform on the setup window and it tells you exactly what to do to put it on your blog. Very cool! SS- Create a story using characters to represent two or more historical figures and have them discuss or debate an historical topic relevant to their era. Foreign Language- Students can create a story with a two way conversation to practice asking/answering questions in a new language. Tellagami is a free app for creating 30 second talking avatars. It's like Voki for the iPad! First pick your character and customize it. Backgrounds can be added from several presets, the camera or photo library. Then record up to 30 seconds of audio or type up to 440 characters. The completed "Gami" can be saved to the camera roll and emailed as a movie. Tellagami is a great app for layering or "smashing" into iMovie. Create multiple 30 seconds Gamis and then combine them into a single movie in iMovie. Toontastic is great for creating longer animated cartoons. Cartoons are created using the built in "Story Arc" with a story setup, conflict, challenge, climax and resolution. Additional scenes can be added as well. For each scene, students add a background and characters. Then students animate the scene and record narration. Finally students pick music based on the mood of the scene. Repeat the process for each scene in the cartoon. Completed movies are uploaded to the Toon-Tube website. Pre-planning is super important for creating Toontastic movies. Have the students create a storyboard before beginning. Also, be sure to have the sound turned on... there's a built in tutorial to guide you through the steps in creating your very own cartoon! Sock Puppets is a super simple app for creating 30 second puppet movies. Kids love it because it disguises their voice. It's great for short explanations. Simply choose the characters, the scene and the props and then record your narration. While recording, tap a puppet and that puppet will lip-synch. Tap a different puppet to switch auto lip-synching to it. Final products can be uploaded to YouTube. Puppet Pals HD and Puppet Pals 2 are a cross between Sock Puppets and Toontastic. 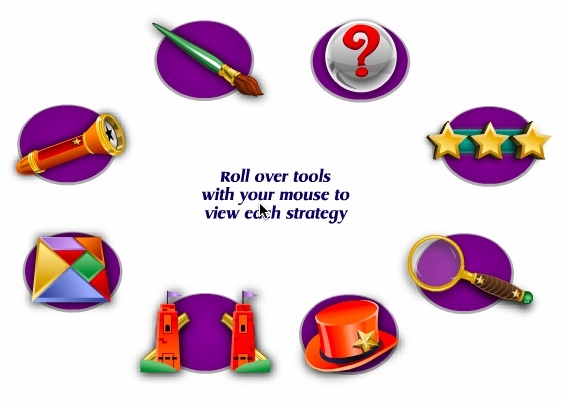 You have more options than Sock Puppets but they're not quite as complex as Toontastic. Choose your characters and scenery and then animate/narrate all in one scene. One thing I love is that the final product can be saved to the camera roll! The free versions are limited in the choices of scenery and characters. What's your favorite digital storytelling app? Leave us a comment! Drawing apps are perfect for creating student artwork to be layered into other apps. Math- Use as a whiteboard to work out math problems. Science- Illustrate the moon phases and save to the Camera Roll. Use pictures to create a digital presentation in Keynote, 30Hands or another Presentation app. SS- Create a map replicating a classroom or school campus. Draw examples of hieroglyphics. Illustrate different types of housing Indians in Texas lived in. ELA- Illustrate idioms, metaphors or other parts of speech. Recreate the setting of a story. Other- Draw a self-portrait for Art class. Doodle Buddy is the most common basic drawing app. Students can choose from a spectrum of colors to draw with a brush, chalk or even glitter. There are some built in stamps that are great for creating patterns or modeling math problems. Students can choose from several built in backgrounds or use any picture from the camera roll as the background... great for annotating! Typed text can be added as well. The final product can be saved in the camera roll and then layered into other apps like 30Hands, Haiku Deck, etc. to create a more complex product. If Doodle Buddy looks to "kiddy" for your students, try ColorBox HD. It looks like a real art box, complete with colored pencils, pens, markers and highlighters. Bonus points go to anyone who can tell me why on Earth there are the 2 lace handkerchief option tools... just tap the tool again to get rid of them if you accidentally add them to your drawing. Weird! We've already looked at Doceri as a Screencasting App but it can also be used just for drawings. I've found that students really like the color choices and there's just something about the smooth lines that is appealing. Rather than recording audio over your drawing, just export it to the camera roll using the share icon. What's your favorite drawing app? Leave us a comment! Aurasma - It's like QR codes but better! Talking word walls or alphabets - scan a word or letter and a video starts to play talking about the word or letter. Basic auras can be created with the iPad app or more sophisticated ones can be created using Aurasma Studio on the web. The iPad app is great because the overlay videos can be taken straight from the iPad camera roll. That means that you can create the videos with any app that saves to the camera roll... Tellagami, 30Hands, Doceri, iMovie, etc. for movies or Doodle Buddy, Pic Collage, PhotoCard lite, Skitch, etc. for images. What a great example of app layering! Into the Book is a great free website for elementary students to learn and practice reading strategies. It can be used for whole class, group or individual instruction using a computer (it's Flash based so it won't work on the iPads). You'll find interactive lessons and videos for 8 different strategies (see below) as well as lots of teacher resources in the "Teacher Area". Photo Project apps are used for creating collages (with labels or information) and annotating pictures. The products of these apps are perfect for "layering" into other apps to create a more complex final product. For example: students might make a PicCollage and use that as a background graphic for a Thinglink project or insert multiple Visual Poet images into the 30Hands app to record narration and create a video. Math - Create a collage of shapes, patterns, or geometric terms with short captions to explain. Create a visual dictionary of math vocabulary. Science - Create a collage of images with short captions from an experiment. Create a visual dictionary of science vocabulary. SS - Create a collage with short captions for events in history or about a famous person. ELA - Create visual poetry. Create collages to describe the setting, characters, events, etc. in a story. Other - Create collages to be used as illustrations for projects created in other apps like Pages, Keynote, iMovie, etc. Create infographics about a topic. There are so many good options and each have a slightly different product so I can't possibly pick just one! Here are some of my favorites. With PicCollage, students create photo collages with multiple pictures and text. Photos can be added from the camera or photo library. (NOTE: It is not recommended to let students explore the gallery or import pictures directly from the web.) PicCollage also has built in frames for organizing your images. Visual Poet is similar to PicCollage except that it has just one frame with 3 photo spots (like the picture on the app icon). Strips of text can be added to each picture. It's great for creating a graphic to be used in a larger presentation. Skitch is used mainly for annotating over a single picture. Students might take a picture of a science experiment and label what was happening or they might take pictures of geometric shapes in the real world and label the parts. Skitch also has built in maps and, if your students are using Evernote, any PDF in the linked Evernote account can be opened and annotated in Skitch. What’s your favorite photo project app and why? Leave us a comment! Math- Create an explanation of problem solving or math vocabulary. Science- Create audio explanations for science experiments or topics. SS- Create a presentation to explain historical events, people or places. I have 2 favorites for this category because they each have a slightly different product. 30 Hands- http://gcisdtraining.wikispaces.com/App-30+Hands 30 Hands is an app that allows users to insert pictures and record audio narration to create a video. Images can be edited or annotated directly in the program or you can draw your own. Images from other apps like PicCollage can be added and narrated for further explanation. It's a great way to integrate the physical world with the digital world. Take pictures of student's paper drawings and create a narrated video. Keynote is the iPad's version of PowerPoint. Students can create slideshows with images, text and embedded videos. Final products can be presented directly from the iPad (using the Reflector software on a teacher laptop computer or using a VGA adaptor) or saved as PowerPoint or PDF files. What's your favorite presentation app? Leave us a comment!